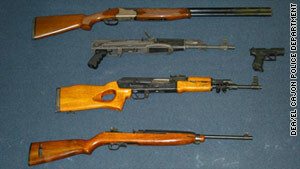 Authorities have seized 34 firearms in addition to bombs, luxury cars, drugs and cash. (CNN) -- Sixty people are under arrest for their role in a Southern California crime alliance between members of an Iraqi social club and a Mexican drug cartel that involved the illicit sale of drugs, guns and bombs, police said Thursday. Since the beginning of "Operation Shadowbox" in January, officers from the El Cajon police department and Drug Enforcement Administration bought "large amounts of narcotics, pharmaceuticals, firearms and improvised explosive devices," El Cajon Police Chief Pat Sprecco said in a press release. A DEA operative was shown a hand grenade and told it could be purchased, purportedly from a Mexican military source, said Sprecco. In addition, authorities seized more than 13 pounds of methamphetamine, 3,500 pounds of marijuana, $630,000 in U.S. cash, three luxury cars, four improvised explosive devices and 34 firearms. Sprecco said he first requested help from the DEA in November 2010 after noticing "increased narcotics trafficking and violent crime" in certain neighborhoods of his city. "These crimes have been attributed primarily to Iraqi organized crime elements, and as this investigation has discovered, the Sinaloa Cartel, a Mexico-based drug trafficking organization," said the chief. The probe focused on the location of an Iraqi social club in El Cajon, a city of more than 90,000 people about 16 miles west of San Diego. Previously, the club was the setting for cases of attempted murder, illicit drug sales, gambling, resisting arrest and illegal firearms sales, the press release states. The Iraqi club had ties to the "Chaldean Organized Crime Syndicate," which has its roots in Michigan in the 1980s and has ties to Sinaloa and the "Mexican Mafia," according to Sprecco. The operation culminated in a raid Wednesday night. In that raid, 100 people were detained and released, $16,000 was seized and authorities found evidence of illegal gambling, according to the police chief. Over the span of the investigation, authorities -- including DEA agents -- also found evidence of prostitution on site, he added.